Now, let's get this straight! Just because the bike design is antique and the sport may seem a little old fashioned, it doesn't mean that penny farthing racing is for the faint hearted! Seated atop a highwheeler careering along at 40kph (25 mph) invites more than the occasional spill. "I've seen the ground coming up to meet me quite a few times," admits Australian National Champion and World Runner–up, Ryan Sullivan, "Fortunately I've never actually broken any bones – but it still hurts!" Still only 20, Ryan is an 'old hand' at penny farthing racing, having competed for the past five years. Youth and fitness apart, Ryan has the advantage of knowing the course intimately, since it passes the front door of his home in Evandale, northern Tasmania (Australia). A National Trust village with a permanent population of 800, the attractive Victorian buildings and streetscape, form a perfect backdrop for the racing and accompanying fair. The Evandale event attracts tourists and high-wheeler addicts from Australia and the world at large. Attracting large crowds and internationally recognised as the largest event in the world devoted to racing antique bicycles, Tasmania's Evandale (20km south of the city of Launceston) has hosted the Australian National Penny Farthing Championships every February since 1983, and has staged the International Championships on three occasions. It was Ryan's mother and father, Di and Michael, who helped initiate the Championships to promote the village. According to Di, "Most of the Evandale folks participate. It's good for the community to be involved in an event we can all be proud of." But it's much more than just penny farthing racing. There are market stalls laden with food, produce and local crafts, demonstrations of country and Morris dancing, and clowns, buskers and jesters mingling with spectators around the streets. Pipe, silver and brass bands provide music before finally joining all the veteran and vintage cars and steam engines on display in a Grand Parade. "We try to create a carnival fun atmosphere," says Di. Today's 'pennys' are not antique 1880s originals, but faithfully reconstructed machines costing anything from 7500 to 40,000 Rand, depending on the workmanship and quality of materials. "It's a lot safer to use reproductions, as they are much stronger and more manouverable than originals," says Ryan. 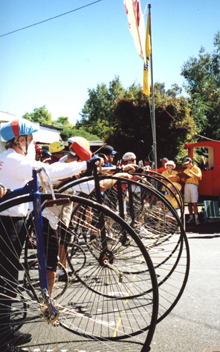 The National Championships are the culmination of a week of penny farthing events in and around Evandale, commencing on the Saturday prior to the National Championships with the Century Ride, with participants attempting to ride 100 miles (160km) in the day. This is no mean feat given that the rider is perched on an ungeared machine with a non-too-effective breaking system. "It's a kind of endurance ride. Something they used to do in the old days. To do a century ride was something of an honour," says Ryan, one of the youngest 'centurions.' On the Friday preceding the Championships, is the Airport Sprint - a frenetic one-mile dash straight down the runway at the nearby Launceston Airport. For those competitors who still have the energy, on the Sunday following the Championships affords the chance to participate in the 30km (20 mile) 'Clarendon Event' on the public roads around the village. This event, takes its name from nearby Clarendon House, one of the most impressive and best preserved Georgian Houses in Australia. A National Trust 'treasure,' built in 1836 and open to the public, Clarendon is an elegant residence, with beautifully proportioned high ceiling rooms and a diversity of outbuildings including a dairy, a butcher's shop, a bakehouse, and extensive stables. 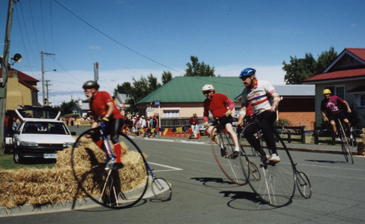 While the actual heats and final around the village streets are the spectacular focus of the National Championships, the programme includes a myriad of other penny farthing races including slalom, relay, handicap, obstacle and biathlon, with categories for juniors, novices and super-veterans. "We usually have competitors from all over Australia and abroad," says Di. Although the racing is keen, and somewhat hair raising, winning is probably not the most important aspect of participating at Evandale. According to National Ladies Champion, Nicky Armstrong, "Most of the riders who come to Evandale are not seriously racing. If you happen to win a race or do well and beat the person who beat you last year, that's just good luck. We come for the fun and enjoyment." As do the many thousands of tourists and international visitors.